One of the first aggressive, straying goalies, Gerry "Cheesy" Cheevers was the backbone of the offensively talented Boston Bruins that won the Stanley Cup in 1970 and 1972. It was an improbable peak to a career that began inauspiciously during the Original Six years, when there were exactly six goalies in the National Hockey League - and he wasn't one of them. Born in St. Catharines, Ontario, Cheevers was raised in Toronto and the Leafs were interested in him from the time he was a youngster. They sent him to the St. Michael's Majors in the Ontario junior league to develop, and that is exactly what happened. Although he played a few games at left wing for the Majors, he was a goalie for most of his five years there. But the Leafs had Johnny Bower in goal and Cheevers wasn't going to displace the "China Wall" from the Leaf cage. Cheevers was sent to the farm team in Pittsburgh and played two games with Toronto without making much of an impression. And he didn't join Boston until 1965-66 after being claimed by the Bruins in the summer Intra-League Draft when Punch Imlach left him open for the taking. By 1968 he was the number one man in Boston, the savior on a team that had the incomparable Bobby Orr and, soon, Phil Esposito and the other great scoring stars. While all the others were in the offensive zone putting the puck in the net, Cheevers was frequently left to his own devices to prevent goals. The only criticism, one that stuck with him his whole career, was that he roamed too much, sometimes with negative consequences. During practice in the 1968-69 season, he began what was to be his most famous trademark - painting stitches on his mask to indicate where a puck had hit him. "I was trying to get out of practice one day," he explained, "when this shot that couldn't have broken an egg hit me in the mask. I faked a serious injury and went into the dressing room. I was sitting there having a Coke when Harry Sinden came in and told me to get back out onto the ice. All the guys were laughing, so I knew I had to do something. I told the trainer to paint a 30-stitch gash on the mask. Then I went out and told Harry, See how bad it is!" In ensuing years, he periodically added more scars and his mask became a symbol of the first generation of mask-wearing goalies demonstrating the safety of face protection. In the summer of 1972, fresh from a Stanley Cup, Cheevers was one of a number of superstars to leave the NHL and join the upstart World Hockey Association. He signed an incredible seven-year, $1.4 million contract with the Cleveland Crusaders, which he thought would be the last contract of his career. But after less than four years he asked to be bought out and returned to the Bruins and the NHL for most of the next four seasons. 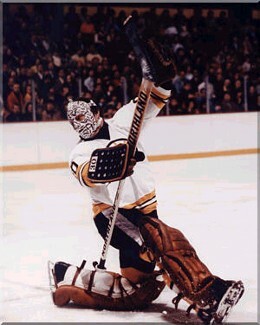 Cheevers was considered the finest playoff goalie of his day thanks in part to his team attitude. He didn't care how many goals he let in as long as his Bruins scored one more. Shutouts and trophies meant nothing. Only the Stanley Cup counted. His career playoff record was 53-34, one of the best ratios in league history. 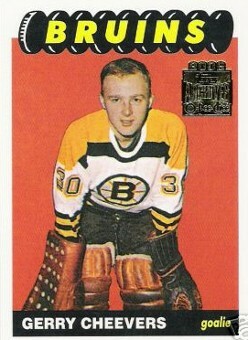 In 1985, Cheevers was inducted into the Hockey Hall of Fame.